Every Day Carry when it comes to what I consider second line gear is basically what is kept in a bag, or in your vehicle. If you are in the habit of keeping a bag of some sort on your person the majority of the time through practice or necessity, there are a few basic items you should consider a minimum requirement for that bag. Now, there is a pretty big temptation when it comes to an EDC bag to attempt to carry everything you could conceivably need when facing a medical emergency, zombie apocalypse or the sudden and unexplainable rock climbing challenge. As a former infantryman I learned the importance of packing light and as a police officer I am constantly reminded that second line gear is just that; essential emergency or routine items for sudden situations. 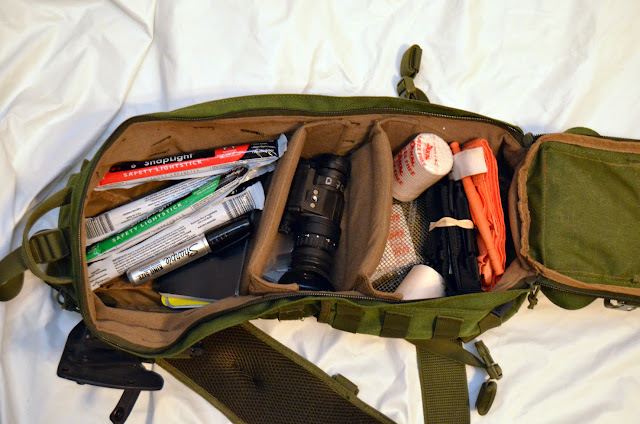 An EDC bag should be large enough for such items and no larger, or it will begin to collect trash, random receipts, misplaced gear and the occasional handful of spent brass. Just as with first line gear, your EDC choices are going to be occupationally and geographically specific. It’s also helpful to take into account your normal travel routine and recreational activities. If you are strictly an urbanite the majority of the year, a snake bite kit or GPS may not take as high a priority as say an emergency phone charger or bus pass. Conversely, if you live in a rural area, you may find yourself wanting to keep more ammunition on hand, or a small emergency blanket. 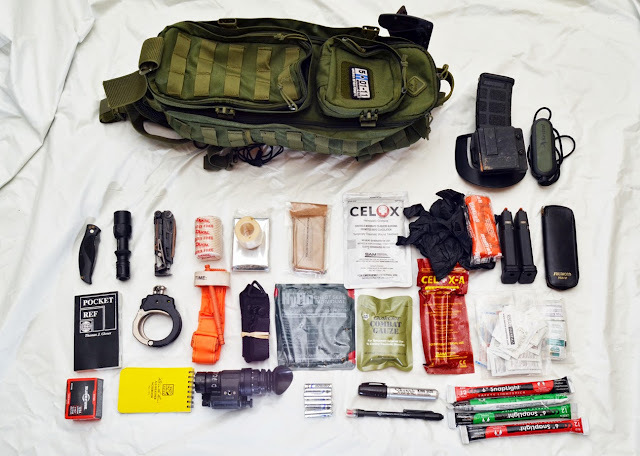 Try as hard as you want, it’s impossible to be prepared for everything with a bag intended to be carried often, but you can certainly cover the more reasonable expectations and leave the rest to your vehicle or third line gear. EDC bag: We choose our bag first, with what we want to carry in mind. My personal choice is a Hazard 4 Evac Plan-B model bag because it literally is the perfect size for what I need and want to carry. Through a few years of experimentation I have collected as many bags and packs as holsters and had all but given up on finding my Goldilocks “Just Right” until I came across Hazard 4 bags. The Plan B is simple, comfortable and fairly modular for its size. Most importantly, it carries everything I need and want in a simple one-shoulder strap design that is just civilian enough to blend in. I didn’t want a bag that screamed gun owner/solider/cop but I did want one in a subdued color with a utility design. OD was a good way to go. As far as the bag durability (which should be a consideration), it’s taken a few tumbles in the woods, more than a few bumps and hang ups along the way and has been soaked more times than I can remember. Perhaps the greatest feature is the fact that it stores almost anywhere and can be slung from chest to back without removing it for access on the go. It is more expensive than some comparable bags but in my opinion, well worth the money. When looking for a bag, I would recommend; durability size, modular features, and a subdued design and appearance that helps it blend in. 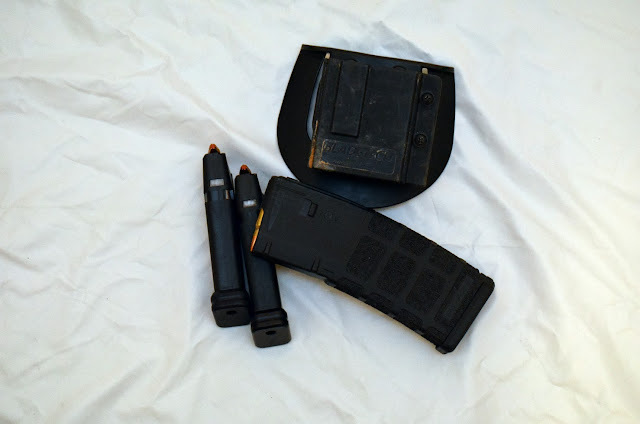 Medical: I am a strong believer in carrying basic first aid and trauma supplies for a number of reasons; the primary reason being that if you carry a firearm or work in an occupation with firearms, there is always a chance for trauma. Even when considering complicated wounds, you can keep medical essentials to a minimum and well within your level of training. It’s also prudent to keep simple bandages and other medical items such as gloves, disinfectant and simple pain relievers on hand. 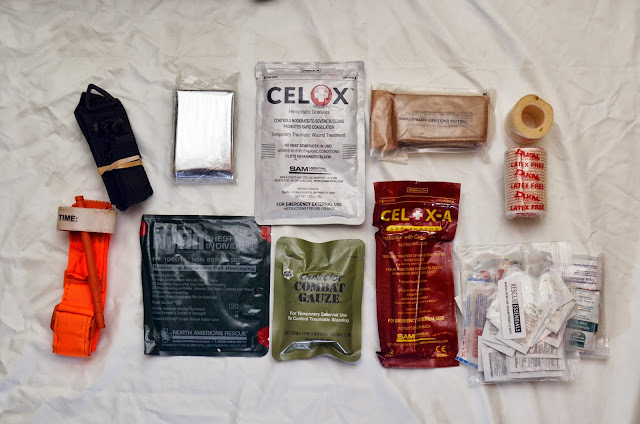 My bag contains immediate trauma treatment items such as a chest seal, Quik Clot, Celox, bandages and tourniquets as well as basic first aid supplies. Obviously my main concern is puncture/penetration wounds. 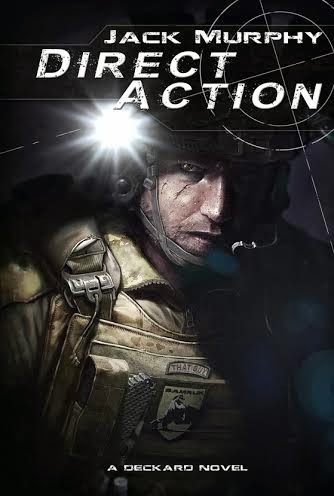 Survival: Survival items are going to be largely subjective and dependent on normal activities, occupation and intent. 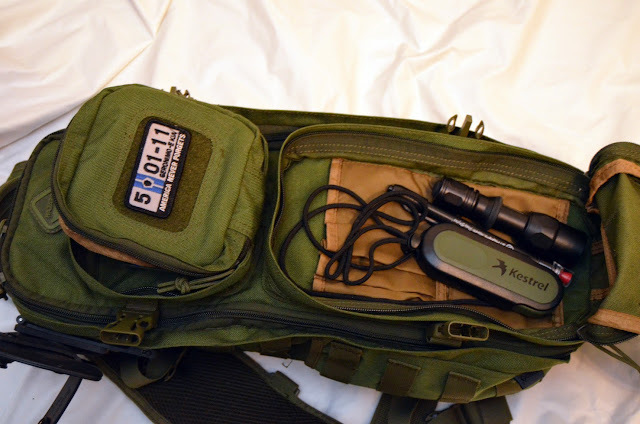 An additional knife, spare batteries for electronic items, a spare flashlight, GPS, emergency blanket, water purification tablets, electrolyte tablets, tape, rope, fire starter, binoculars, sunblock, water, food; the potential list of items that falls under survival can get large, fast and just like medical items, can quickly fill up your bag before you have a chance to consider any other items. Keep it as simple as possible in regards to what you can expect to encounter and you can obviously add or remove items based on your travel plans. 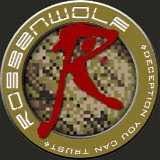 My list of “survival” items is small for my EDC, as most of my “Survival” items go to my third line gear. 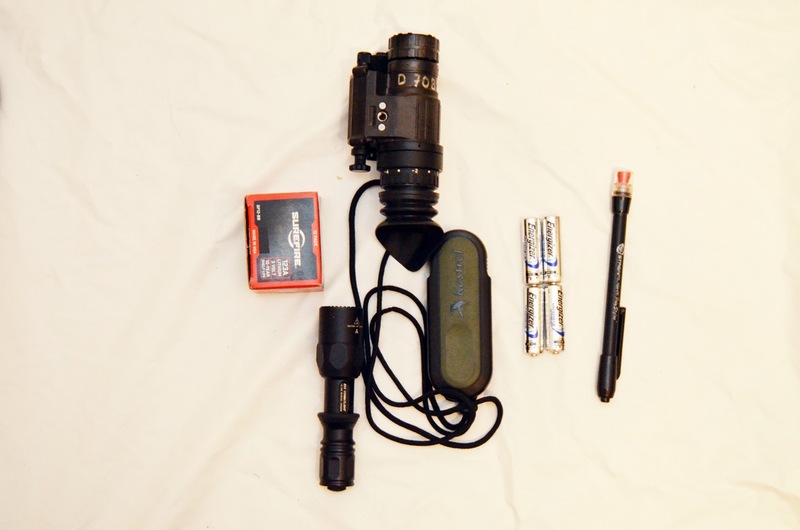 A kestrel, some spare batteries, a Streamlight stylus (which is a nice piece of gear with reasonable brightness and changeable color heads), NODS and a backup Surefire flashlight are that can usually be found in my bag. Tools and equipment: Basic tools are a good idea to keep on hand, from a simple multi-tool to a small tool kit. Most problems you encounter can be solved readily without the need for carrying the additional weight of multiple special purpose tools. Remember, for EDC we want the bag to be simple enough that it’s not cumbersome or heavy, which will lead some to only carry it occasionally. 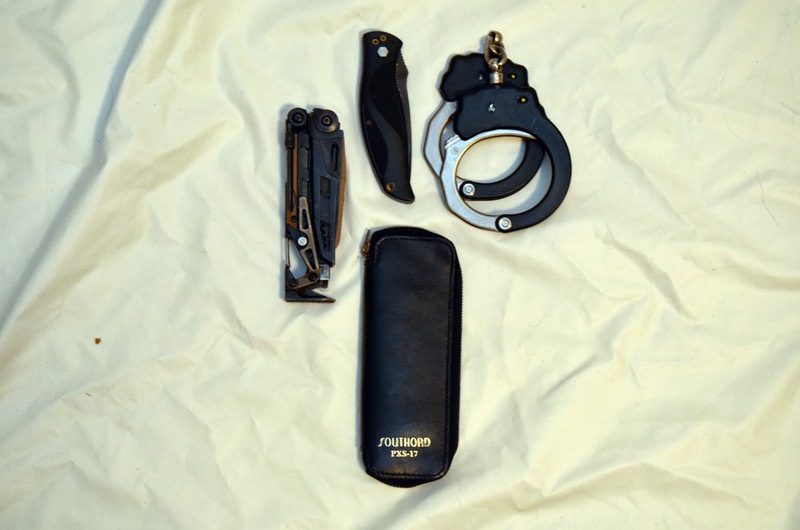 I tend to keep it very simple in terms of tools and equipment, normally only carrying a spare pare of cuffs, multi tool and knife. I also keep my pick set in my EDC bag. General convenience items: This is another category that can quickly add weight and reduce available space in a bag. Simple items that you will use often such as a small camera, note pad, pens, markers, lighter, zip ties, etc. Many of these items will also fall into other categories or serve multiple purposes. 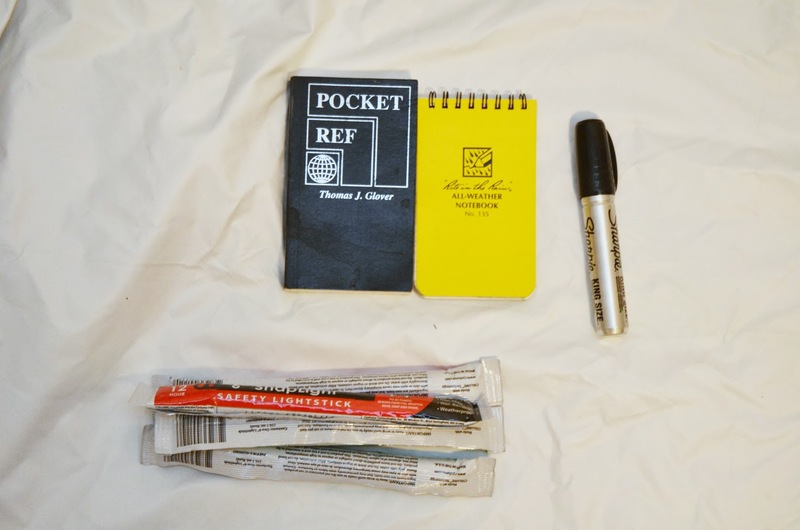 I have a pocket Ref, not pad and some chem lights. 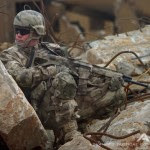 Weapon Specific: It’s always a good idea to have extra ammunition on hand, as well as a way to carry that ammunition on your person if the need arises. I keep a minimum of two additional handgun magazines for my EDC Glock 19 and one additional AR magazine for the AR in my vehicle inside my EDC. Obviously more can be added if I feel the need. Occupational items: If you work in LE, private security or just want to be prepared for the eventuality, restraints of some sort are wise to have in your bag. One or two pairs of handcuffs or flex-cuffs are great to keep close by. I would avoid using zip ties in place of flex cuffs as even the larger and thicker zip ties are not designed to restrain people, even if they can actually be used to do so. As you can see by those items I keep on hand, my bag is set up more occupationally than it is recreationally. This doesn’t mean a citizen can’t have the exact same items, in fact I would encourage it. I want every responsible citizen, regardless of occupation, prepared for the when not the if and that means taking a basic EDC seriously. You can add to, or take away from these recommended items as you need but I would strongly recommend at the minimum, spare ammunition and medical in your EDC bag.